Following the presentation on the letters having to do with the Hammond Family at Redcliffe, Elizabeth Laney, presenter answered questions of the audience. Here she is pictured with, left to right: Roonie Floyd of AIken, Elizabeth Laney, and Craig and Theresa McMullin of Edgefield. In her presentation at the bi-monthly Old Edgefield District Genealogical Society (OEDGS) meeting on the square in Edgefield, on Sunday, Elizabeth Laney told of the Hammond papers and how to access them. The Hammond papers refers to a collection of documents relating to James Henry Hammond (SC Governor, US Congressman, US Senator), his descendants, related families, African-American families enslaved on or later employed at Hammond properties. Although there are several repositories for this collection including the Library of Congress and Redcliffe Plantation State Historic Site, the main repository for this vast collection is at the South Caroliniana Library at the University of South Carolina. 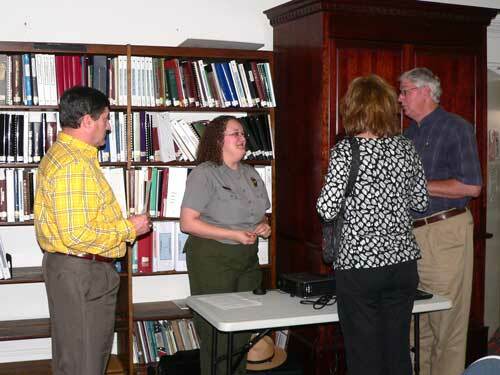 Ms. Laney, Park Interpreter for Redcliffe Plantation, told how to access Hammond Paper. She noted that three of the most significant photograph albums of John Shaw Billings contain Hammond family pictures from the 1880s through the 1950s. Laney briefed the audience on Sunday about the Ardis family who worked as enslaved laborers at Silver Bluff Plantation from the mid-1840s through 1865. This was for many a most interesting part of the program.